L'Oreal represents Lash Architect 4D ink with effect of false eyelashes of the future. Force of hypnosis of the modeling fibers... Your look is ideal from all points of view! Innovative formula with unique fibers - the special 4-millimitrovy modeling fibers as a part of flourishes L'Oreal Lash Architect 4D are made of the same material which is applied by production of false eyelashes. At the expense of it the real four-dimensional effect for eyelashes of improbable length is provided. Coal-black pigments also are a part - twice more saturated in comparison with a classical black pigment, they do eyelashes saturated black and faultlessly paint over them. The natural bend of eyelashes is fixed by special vegetable voska. Specially developed brush architect creates effect of false eyelashes. 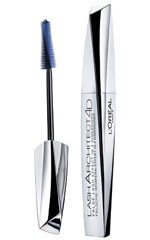 Unlike usual, the brush of L'Oreal Lash Architect 4D is slightly narrowed to a tip thanks to what it accurately and evenly distributes ink on each eyelash, taking even the smallest eyes in corners. 1D - Volume at one stroke thanks to high concentration of fibers of nylon and natural fibers. The 2D - Improbable length with thin, long nylon fibers of saturated black color. 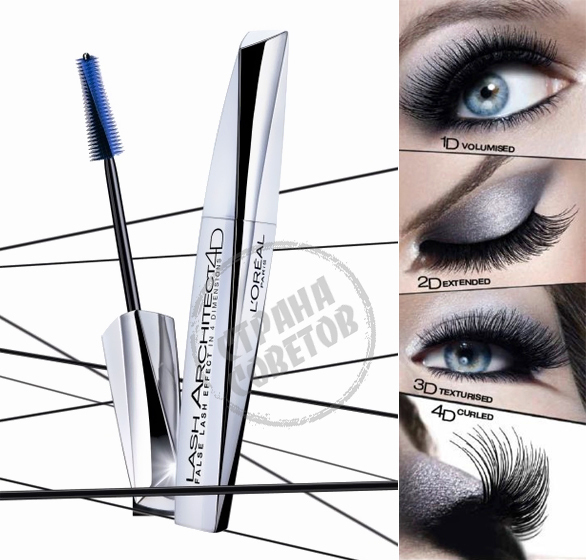 The 3D - Ideal prokrashivaniye of each eyelash in the deep black color. 4D - the Long podkruchivaniye without lumps by means of the special brush located at an angle.